The fall semester reports were mailed home on January 5th. These included students’ final semester grades and comments written by their teachers. If you did not receive your student’s report, please contact Lina (lina@wissf.org). We will be holding a faculty meeting the morning of January 24th. 8:30am classes will be canceled, and all other classes will be held as usual. Students should arrive to school in time for their 9:30am classes. School will be closed on Friday, January 27th in observance of the Lunar New Year. Classes will resume as usual on Monday, January 30th. The first progress reports of the new semester will be given to students on Wednesday, February 1st. If you do not have the opportunity to view your child’s report, please contact Lina for an additional copy. We will be having our annual Culture Night Potluck the evening of Friday, February 17th from 6:00-8:00pm. Please save the date! We hope to see you there to celebrate the wonderful diversity of our community. Please bring a dish from your culture to share. School will be closed on Monday, February 20th in observance of Presidents’ Day. Classes will resume on Tuesday, February 21st after our faculty meeting. Students should arrive to school on Tuesday in time for their 9:30am classes. We would like to include your child’s baby picture in this year’s yearbook. Thank you to those who have already sent them! Those who haven’t yet, please send a photo to Ariel by the end of this week (aedwards@wissf.org). The past two weeks of Advanced Art have been focused on Op Art. Students Looked at the work of Bridget Riley, Victor Vasarely, and Frank Stella. 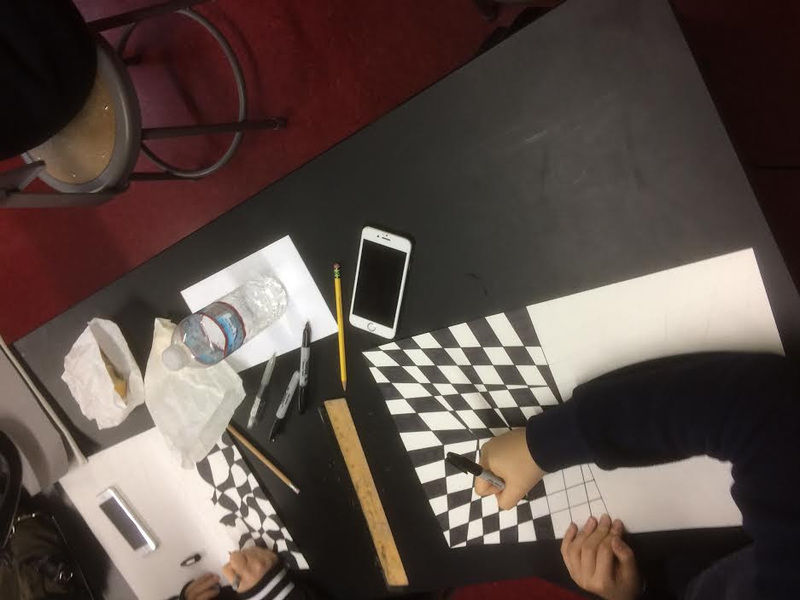 After looking at a variety of paintings and sculptures the students created their own black and white drawings in order to explore the figure-ground relationship. Monday, February 6 at 7:30 – 9:00 p.m.
$10 contribution requested at the door. Non-member tickets available at http://parentscoalition.net/annual-calendar-of-events-2016-2017/with-danielle-ramo-phd-spring-2017/. This will be a 2017 update on Dr. Ramo’s outstanding 2016 presentation, which you can review here: http://parentscoalition.net/wp-content/uploads/2016/02/Click-here-to-download-Danielle-Ramos-presentation-from-Feb.-1-2016-talk-PDF.pdf. WIS can only provide official transcripts from WIS. You will need to contact your other schools for their official transcript.